Heung-Min Son came to the rescue for Spurs this afternoon, as the forward scored a fine goal from outside the area to hand his side an 82nd minute lead vs Newcastle at Wembley. Spurs had been trying hard to break Newcastle’s defence down throughout the match, and they finally managed to do so just eight minutes from time thanks to a fine strike from Son. 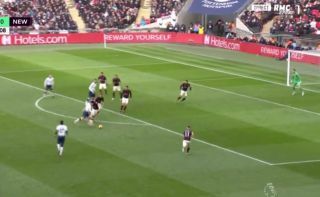 The goal came after a long ball up to Fernando Llorente was knocked down by the Spaniard to Son, who controlled the ball well before firing home from outside the area. You can catch Son’s goal below. Great play from both him and Llorente, there! Llorente knocks it down for Son who shimmies into space and lashes it through Dubravka. It should've been a comfortable save for the Newcastle keeper.